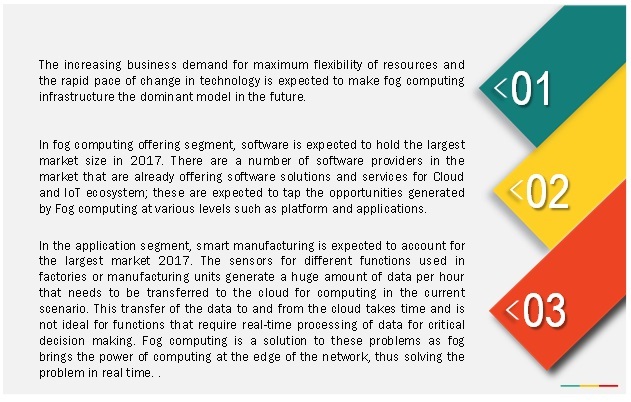 [126 Pages Report] The fog computing market is expected to grow from USD 22.28 Million in 2017 to reach USD 203.48 Million by 2022, at a CAGR of 55.6% during the forecast period. The adoption of fog computing technology is expected to grow in proportion with the growth of connected devices and cloud infrastructure. Major drivers for the growth of fog computing are bandwidth limitations and low latency of existing IoT infrastructure, growing need of real-time applications, increased awareness of data security, and need for performing analytics at the edge of the network. The forecast period for the market is considered between 2017 and 2022. The need for real-time computing is the motivation behind the need for fog computing. Fog computing is a paradigm that extends cloud computing to the edge of the network. The evolution of IoT and the huge amount of data that it generates has created the problem of high internet traffic, which further increases the problem of latency that the world is facing. Fog computing is a technology that can help in overcoming all these problems by bringing the power of computing at the edge of the network. 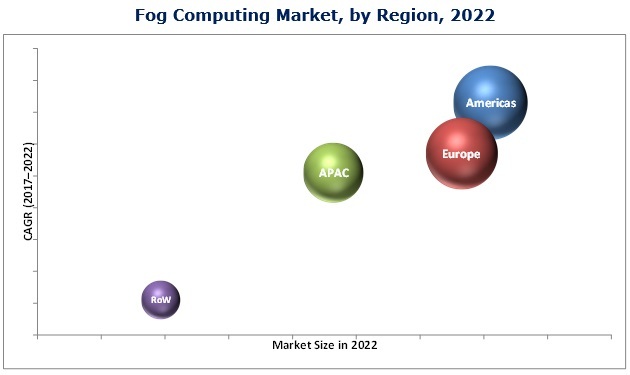 The fog computing market ecosystem includes connectivity hardware providers, connectivity solution providers, and end users. This report provides valuable insights into the ecosystem of this market including connectivity hardware providers such as Intel and ARM Holding Plc., among others; connectivity solution providers such as Microsoft Corporation (U.S.) and PrismTech Corporation (U.S.); system Integrators such as Nebbiolo Technologies (U.S.) and Dell Inc. (U.S.). In June 2016, Cisco released IOx, an application enablement platform that provides uniform and consistent hosting capabilities for various types of apps across various Cisco platforms in fog computing. In March 2016, PrismTech announced Vortex 2.1, a set of the most comprehensive, real-time data sharing platforms for IoT, which also support fog computing, with the name Vortex Fog. In April 2016, Fujitsu announced that it is working with Microsoft, ARM, Cisco, Dell, Intel, and the Princeton University Edge Laboratory to form a consortium that aims to speed up the development of core technologies for fog computing. How the fog computing disrupts the various industry verticals? How traditional computing hardware and software companies can leverage the growth of fog computing market? Company information: Detailed analysis and profiling of additional five market players. Further breakdown of the Americas fog computing market into North America (U.S., Canada, and Mexico) and South America (Brazil and others). Further breakdown of the European fog computing market into France, the U.K., Italy, Germany, and Rest of Europe. Further breakdown of the Asia-Pacific market into China, Australia, Singapore, and Rest of APAC. The fog computing market, in terms of value, is expected to grow from USD 22.28 Million in 2017 to USD 203.48 Million by 2022, at a CAGR of 55.6% between 2017 and 2022. The market would be highly diversified and competitive with market players including top-tier and mid-tier companies as well as start-up firms. With the rate of proliferation of smart sensors, the increasing adoption of IoT-enabled devices, and mainstreaming of many smart applications, the fog technology is expected to become the most popular concept across domains such as manufacturing, energy, transportation & logistics, and healthcare, among others. Concurrent IoT infrastructure is not capable of handling critical, real-time, and heavy applications because of bandwidth limitations and low latency requirement of such applications. Therefore, it has become imperative to introduce an additional computational network layer between cloud and edge devices. This layer is the fog computing layer. It comprises fog nodes and fog computing platform. Fog nodes are the generic networking devices such as routers, switches, controller, gateways, and servers. In other words, any device with computation, storage, and networking capability can be a fog node. Fog software comprises two stages: the platform enables the generic design of computational parameters and processes and the customized service software enables application-specific design of fog nodes. The smart manufacturing application would hold the largest share of the market followed by smart energy. A number of sensors are used for different functions in factories or manufacturing units, which generate huge amounts of data per hour that needs to be transferred to the cloud for computing. This transfer of data back and forth takes time and is not ideal for functions that require real-time processing of data for critical decision making. Fog computing is a solution to these problems as fog brings the power of computing at the edge of the network, thus helping to solve the problem in real time. This would help manufacturing companies in better decision making with real-time data, which would also help in reducing the operating cost. The market in the Americas is expected to hold the largest share of the market in 2017. The major driving factors for the growth in the Americas are the intense research and development in the field of fog computing, high penetration of Internet of Things, and growth of a number of IoT and cloud start-ups. The adoption of fog computing technology is expected to grow in proportion with the growth of connected devices and cloud infrastructure. In the manufacturing application, the growing potential of Internet of Things (IoT) to improve the productivity in the production processes and the supply chain would lead to the need of a technology that would help in real-time data computing for better decision making for time-critical operations. Fog computing is expected to fundamentally change the way products are developed, manufactured, transported, and sold. At present, a very small percentage of manufacturing operations are using connected enterprises because of the concern of data security while transferring it to the cloud for computing. However, fog would help in the computing of data at the network edge and only limited information would have to be transferred to the cloud. Thus, the fog setup is expected to attract more manufacturers toward the connected enterprise. The oil & gas and power industry’s search for hydrocarbons has expanded to increasingly remote and extreme environments and the focus on safety and efficiency is driving the need for Internet of Things solutions within the industry. The energy loss due to leakage and accidents is another concern that needs to be addressed on priority. Fog computing can help in remote monitoring and on-the-spot decision making that would help in reducing the chances of any accident or disruption in operations. Fog computing can also compensate for the shortage of skilled workforce for collecting and analyzing equipment data. Moreover, it also helps reduce the risk to the lives of the workforce and improves overall safety and efficiency. The implementation of Internet of Things in transportation systems has enabled a whole range of advanced capabilities for increasing the passenger safety and operating efficiency of logistics and transportation. IoT is proving very useful in all the modes of transport, namely, aviation, railways, roadways, and maritime transport. However, with the installation of so many sensors, huge amounts of data would be generated, which would create a need for additional intelligence for analysis and real-time response. Fog computing would help in processing this data locally to enable real-time asset management and monitoring to cut down or minimize operational risks and downtime. Fog computing would also help in monitoring and controlling engine idle time to reduce emissions, conserve fuel, and in turn, maximize profits for the organizations. What could be the potential industrial applications of fog computing technology? Which companies are among the leaders in fog computing market? The lack of skilled talent in fog computing technology skills is a major restraint for the growth of this market. 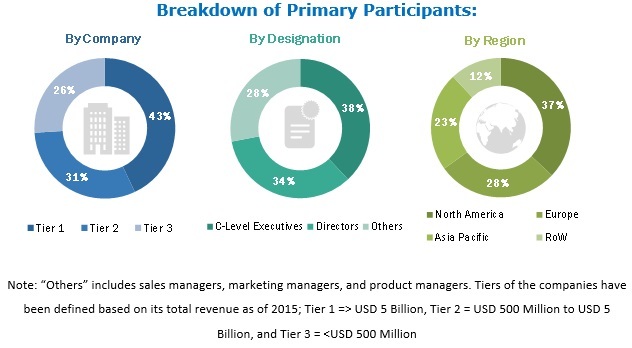 However, the fog computing market offers a huge scope for innovative cross-domain applications and development of comprehensive system solutions. There are several potential growth opportunities for system integrators, platform providers, communication technology providers, and cloud service providers in this market. The major players engaged in the development of FOG COMPUTING are Cisco Systems, Inc. (U.S.), Microsoft Corporation (U.S.), ARM Holding Plc. (U.K.), Dell Inc. (U.S.), Intel Corporation (U.S.), Fujitsu (Japan), GE Digital (U.S.), Nebbilo Technologies (U.S.), Schneider Electric Software, LLC (Japan), Toshiba Corporation (Japan), and PrismTech Corporation (U.S.). Cisco Systems, Inc. offers routing, switching, and associated services including comprehensive security and mobility solutions. Cisco offers its products and services to help improve productivity and efficiency for application areas such as oil & gas, manufacturing, utilities, connected transportation, smart & connected cities, mining, public sector, and connected factory with its IoT solutions and services across the globe. *Details on Overview' Products and Services' Financials' Strategy & Development Might Not Be Captured in Case of Unlisted Companies.